In The Happiness Track Emma Seppala explains that behind our inability to achieve sustainable fulfillment are counterproductive theories of success. Success doesn't have to come at our personal expense. Drawing on the latest research into resilience, willpower, growth mindset, stress, creativity, compassion, mindfulness, gratitude training and optimism, Seppala shows how nurturing ourselves is the most productive thing we can do to thrive professionally and personally. 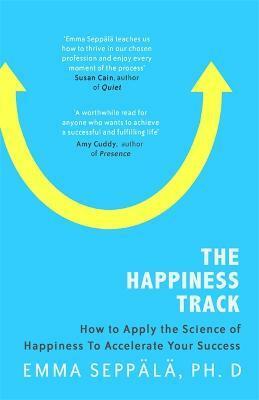 Filled with practical advice on how to apply these findings to your daily life, The Happiness Track is a life-changing guide to fast-tracking your success and creating an anxiety-free life. Emma Seppala is science director of the Center for Compassion and Altruism Research and Education at Stanford University and co-director of the Yale College Emotional Intelligence Project at Yale University. Her field of expertise is health psychology, well-being, and resilience. This research was highlighted in the documentary film Free the Mind. She conducted ground-breaking research on mind-body practices for combat veterans and has also conducted research on medication and compassion. Her research has been featured in the New York Times, Forbes, The Boston Globe, U.S. News & World Report, The Huffington Post, Inc., and Fast Company. She has appeared on Good Morning America, ABC News, and Fox News. She is founder of the popular online magazine Fulfilment Daily and has written for Psychology Today, Harvard Business Review, The Huffington Post, Scientific American Mind, Mind Body Green, and Spirituality & Health. Seppala consults for Fortune 500 leaders on building positive organizations. She regularly addresses academic, corporate, and governmental institutions. She holds an undergraduate degree in comparative literature from Yale University, a master's degree in East Asian languages and cultures from Columbia University, and a PhD in psychology from Stanford University. Originally from Paris, France, she is a native speaker of French, English, and German.